You know its a crazy week when you consider reaching out to Jessica Alba at The Honest Co. for some organizational help... (lol). We are expanding our wholistic beauty empire, focusing first on growing our Gemstone rollers for beauty and wellness, so we wanted to get really clear and answer some questions of yours coming from a scientific perspective. Many people ask us how jade rolling helps sagging, fine lines, wrinkles, etc. For the same reason it is a total-body detox tool, it is also promoting your most youthful complexion through lymphatic drainage! Supporting Lymphatic system health is the primary goal of jade rolling, as it culminates health and leads to a brighter, more youthful, healthier complexion. The Lymphatic system is also known as the immune system. Made up of lymph, lymph nodes, the thymus gland, the spleen, and the lymph vessels. This system is of vast importance, yet largely ignored by Western medicine. It is an integral, fundamental part of Eastern medicine and spa culture is waking up to just how powerful these modalities can be. The lymph is an ocean under your skin, and you must make waves to maintain your best state of health. This fluid remains stagnant because it has no central pump, though it is your bodies main drainage system. You must move it to promote detoxification, by means of manual stimulation and contractions of muscles, along with deep breathing. The lymphatic system is a complex network of vessels and tissues, working together to eliminate toxins from the body and balance the self. Lymph can be thought of as a “bath water” of sorts, a watery fluid which carries away infection, moving it to the lymph nodes and spleen to allow white blood cells to fight and filter. Also carries protein molecules, glucose, salt, and nutrients throughout the body. It lies beneath the epidermis, when moving it is constantly replenishing nutrients to the cells. A healthy lymphatic system is one that is active, and a strong lymph system will support digestive, circulatory, and nervous system activities. What happens when we don't move our lymph? A Naturopathic doctor, Megan Ding, certified in natural cancer support and prevention in Charlotte, NC referred me to several articles to support the further research of the lymphatic system, referencing articles from the University of Osaka by professor Takakura of the Research Institute for Microbial Diseases. “Impaired function of dermal lymphatic vessels lead to accumulation of subcutaneous fat, which ultimately causes ‘sagging’ of the skin. Sagging is attributed to a decrease in collagen fibers or reduced elasticity, accumulation of subcutaneous fat, enlargement of adipocytes. The results revealed that 1) fatty acids, which are present abundantly in lymph, cause the destabilization of lymphatic vessels, leaking from the vessels, and 2) leaked fatty acids directly promote the differentiation of adipocytes. 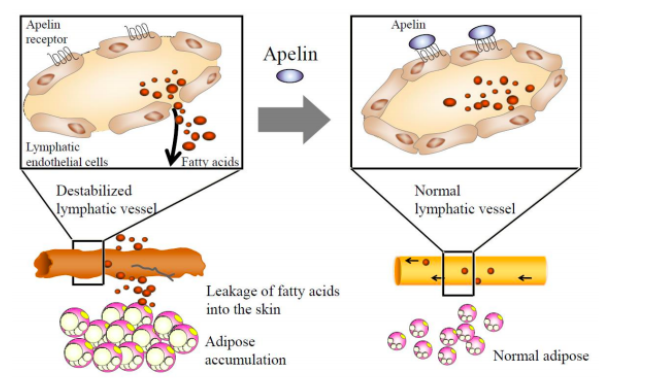 Furthermore, it was found that Apelin (a peptide known to stabilize vascular structure) has a function to suppress the leakage of fatty acids from lymphatic vessels. A natural substitute for Apelin which promotes lymphatic vessel health is surprisingly widely available, yet lacking in the cosmetic industry: pine cone extract. Shown to aid repair of vessel structure so as to reduce swelling of tissues through retaining the adhesion molecules, thus reducing the leaking of fatty acid and accumulation of adipose. In addition, when a trial product formulated with “pine cone extract” was used for two months (morning and night), effects were observed to improve the nasolabial line, the facial line, and sagging of the neck through depressing the destabilization (happening via fatty acid leakage) of lymph vessels. Jade rolling can also aid lymph vessel health. We recommend using a hydrating, whole plant hydrosol followed by a serum with our Jade Roller PRO, the best for sagging skin because it rolls with a gentle, distributed pressure: the best pressure for promoting lymphatic drainage. Angela Peck developed a specific Lymphatic Drainage technique for our rollers, and an educational process card is included with each one. BRAVO to you ladies in this beautiful industry. Thank you for inspiring me, supporting the world in wellness in our aligned missions. WE are the promoters of true autonomous healthcare in a society ridden stuck in a reliant system with poisonous "solutions". Never stop informing others of your truth, therein lies your power.